I’ll go ahead and apologize for the crappy, blurry photos. I must have been excited about veggies and didn’t take the time to do a better job. Oh, well. Better luck next week. 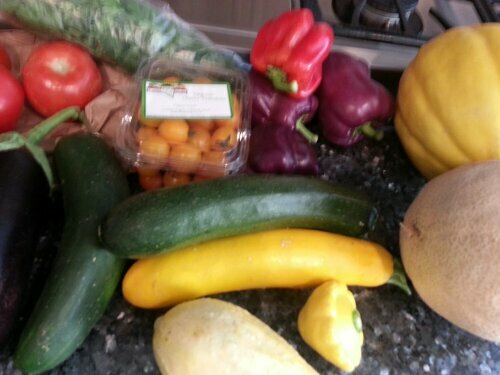 What am I going to cook with all of these fine goodies? 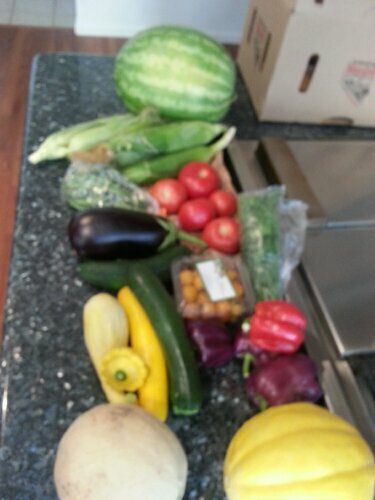 Well, we are going camping this weekend so the squash, eggplant and corn are going straight on the grill. I plan to eat most of the watermelon straight off the rind while sitting on the beach and, yup, if I do find a seed … I’m just gonna spit it right out on the ground, hillbilly-style. This box is pure summer and I’m going to enjoy it as such. I haven’t posted any recipes or cooking adventures lately because we haven’t really done anything exciting with the fruits and veggies other than just eat them. Raw. Au naturale. I love a good salad or to just throw some veggies on the BBQ with a steak. You can only post so many pictures of that on a blog. Uh … I guess there was a little bit of bacon involved in a green bean cooking incident. I could have posted that. You can never see enough bacon, right? What are you making cooking plans for right now?